A shooting drill with a lot of passing elements to it – gets the hands and feet moving with a lot of pace. X’s and O’s all start at the same time. The X & O that carry a puck cross with their respective partner and make a drop pass (inside the blue line). This player then skates into the outside lane while the original puck carrier skates into the inside lane on the far side. The outside lane gives a bump pass to the player skating in the inside lane from the opposite side (the original puck carrier gets the puck back from the other end). 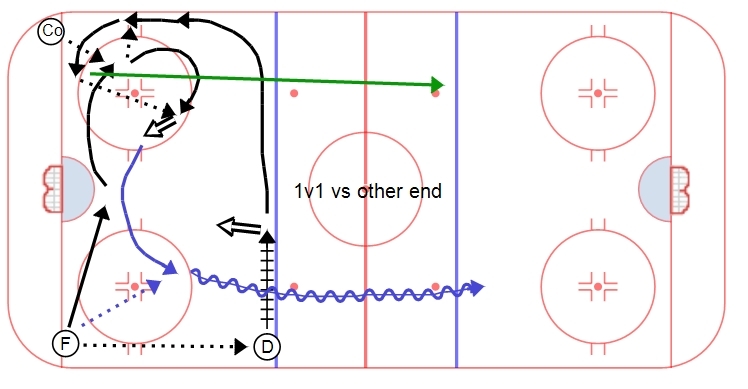 The two X’s then go attack the far net 2v0 (the O’s do the same thing). A little confusing, but in short: Drop pass to your partner. Fill either the outside lane (pass receiver) or the inside lane on the far side (original puck carrier). Receive/give a pass to the other twosome. Go in 2v0 with a long shot and rebound. A progression from last weeks Yale 1v1, only 2v2. The same thing is going on in both ends. The puck starts in the corner with two F’s. 2 D man the points. Puck goes from the corner to the point, then D to D for a shot. The two F’s go to the slot for a screen presence, then cycle a second puck out of the corner – again D to D for a shot. After the second shot, the two F’s get a puck from their line while the 2 D regap and take back ice. 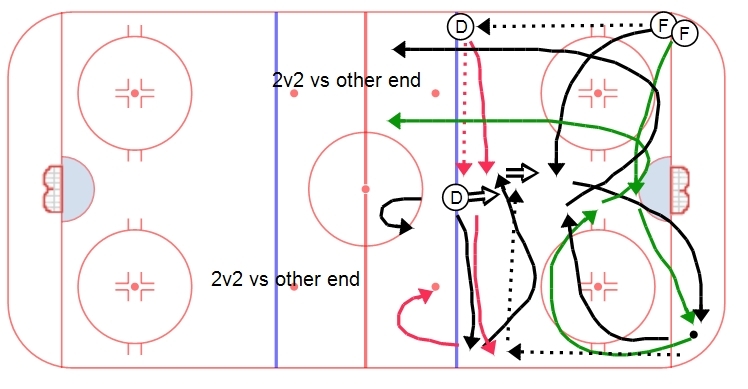 The two F’s then attack down the other end of the ice (top) while the D play a 2v2 rush coming from the other end (bottom). 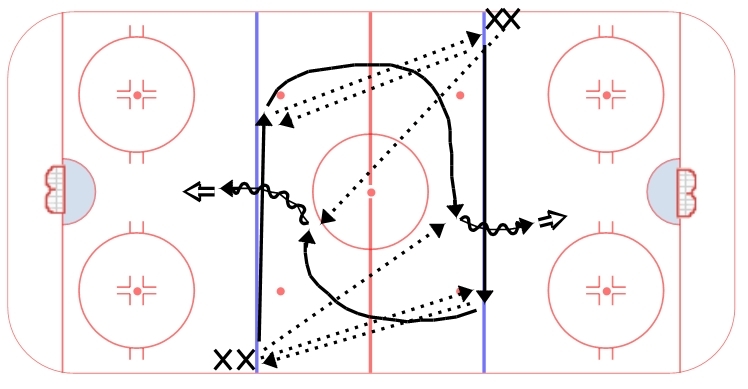 A good drill with two shooting elements (point shot w/screen and quick pop in mid slot) as well as a full ice 1v1 rush. It runs out of both ends at the same time. The play starts with a puck in the corner with the F’s. F passes to the D who walks the line and takes a shot. The F skates to the net front for a moving screen, then goes into the corner to pick up a second puck. The D who shot the puck then skates across the blue line and down the wall, executing a scissor drop pass with the F. The D then passes to the F for a quick shot in the mid slot. After the second shot, the D then turns and quickly takes back ice to gain a gap on the attacking forward coming from the other end (green). The F who shot the puck then receives a pass from their line and attacks down the other end of the ice (blue) vs a D who is gapping. This results in a full ice 1v1. A simple shooting drill with multiple opportunities for passing and receiving. Both lines go at the same time. The first player in each line takes off across the blue line. Near the far dot, they receive a pass from the opposite line and quickly return the puck back to the line they got it from. 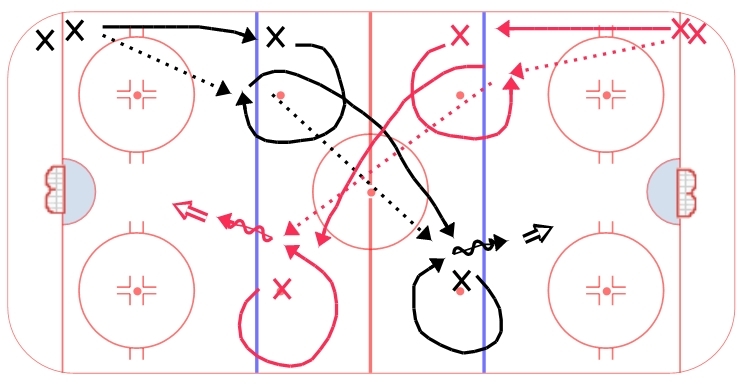 The player then takes off on a stretch and support pattern through the neutral zone, receiving a pass from the line they started from before heading over the blue line and attacking the net. The same thing is happening on the far side. Across the blue, receive/give a pass, then come back across through the neutral zone to receive a stretch pass and attack the net. Skills worked here include: passing and receiving with your feet moving, shooting with your feet moving, quick accelerations and change of direction, communication. A great drill to get hands, feet and mouths moving, as well as get some long shots on the goaltenders. I’m fascinated by the use of high level statistics in the NHL. I think it’s a great way to look at the game from a different angle and challenge previously held beliefs that are common in the game. NHL teams spend a substantial portion of games on special teams. 5v4 time alone accounts for 10-20% of game time, and thus needs to be analyzed to further our prediction models. Although we don’t have enough years of NHL RTSS (5 years and counting) data to conclude with statistical significance, it appears that Fenwick For/60, with misses and blocked shots adjusted for scorer bias, is the best predictor of power-play success (GF/60), and well correlated with winning (Pts/game). The penalty-kill picture is less clear, likely the result of heavier regression to the mean. Presumably the heavier regression is because PK units spend much more time without the puck. Both Sv% (which is likely goaltender driven), and Corsi differential/60 (Corsi For – Corsi Against per 60) are predictive of future penalty kill success (GA/60), and winning (pts/game), but less powerful than the predictors of power-play success. Shooting percentage on the power-play is negligible, regressing heavily to the mean, and shows at best very modest correlations with PP success and winning. Even if we attempt to attenuate Sh% (ie. control for how much it regresses to the mean), it still under-performs other more significant metrics like FF/60. If we focus on which stat in theory has the strongest association with PP success (GF/60), we see that Fenwick For per 60 and Shots For per 60 are virtually indistinguishable. On the PK, however, Sv% becomes the strongest stat. Looking a little closer at PP and PK is the Flyers blog Broad Street Hockey. In two articles, they dig into PP and PK and how you can look at future success for each of them. Their bottom line conclusion? PP success is indicated by shot rate while PK success is a little simpler, with just conversion rate. You can check out the PP article here: http://www.broadstreethockey.com/2011/5/22/2178537/zone-entries-what-drives-power-play-success and the PK article here: http://www.broadstreethockey.com/2011/5/14/2170957/what-makes-a-good-special-teams-unit. My takeaways from these articles and insights into statistics? Well it also passes the “eye test” with hockey. Want to have a successful power play? It comes from shots. Shots come from faceoff wins and puck retrievals in the offensive zone. Want to have a successful penalty kill? A good goaltender goes a long way – as does limiting the quality of shots against. Finally, you can look at analytics to see if your success on special teams is due to random events or methodical success through statistical trends. I’ll be honest, as a history major in college I never took a stats class and I couldn’t tell you what the actual equations and statistical work means. However, I trust that you need that data to prove your points and that the greater analytics community would immediately invalidate any argument that doesn’t pass the statistical data test. I try not to get too lost in the math but instead interpret the numbers and determine what they mean and what the effect on the game might be.